Ben had his five year check up today (even though he's been five for a couple of months). He was so calm and patient, sitting with his hands as shown in the photo. So I asked, "Ben, are you pretending to be an angel because of the big dress you are wearing?" "No Mommy, I'm praying", he replied. I asked what he was praying about. "DUH!" he said, "So I don't hafta get any shots!" He didn't have to get any shots, but he did get his blood drawn. He cried. I'm sure there will be more tears in the morning from my older child who gets to have his almost-eight-year-check-up tomorrow. For those of you wondering, Benjamin is doing great. 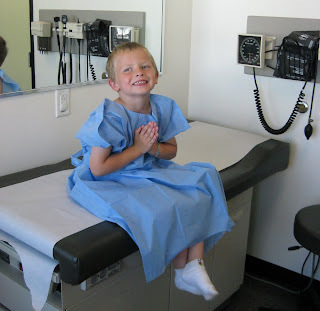 We hit the inevitable hiccup this year when the school nurse came across Ben's medical papers and the list of things "wrong" with him. She called to introduce herself and asked if Benjamin has any "restrictions". I laughed and told her to go ahead and try to restrict him! On a serious note we have taught Ben from a very early age that it's always best to listen to our bodies and to rest when needed and to remind him of what it might feel like when we are tired. And so far he does a great job of "listening". We're still not to the point where we'll need to really keep him from any activities, but that day is marching toward us. He'll have another appointment with the pediatric cardiologist in a month to give one last check before we're off to Asia.